Two longtime Hawkeye fans reach remarkable milestones at Kinnick Stadium. PHOTO: TIM SCHOON / UI OFFICE OF STRATEGIC COMMUNICATION Marilyn Neely, 50BA, second from left, celebrated 70-plus seasons of Hawkeye football fandom in September at Kinnick Stadium with son, Bob Neely, 82BSEE; granddaughter Eva Jones; and daughter, Susan Neely, 78BA. Iowa’s football record books are filled with notable streaks: the 20-straight victories in the 1920s, the eight consecutive bowl berths under Hayden Fry, and the 58-straight home sellouts that ended in 1990. Even those historic runs, though, can’t measure up to the attendance milestones reached by a pair of UI alumni this season. 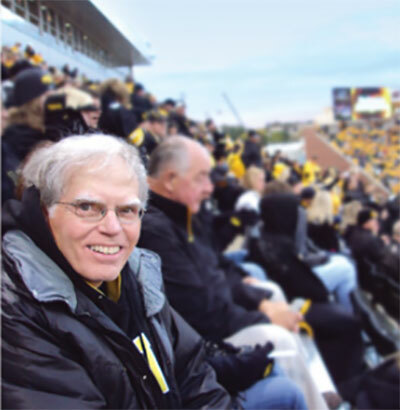 Bob Morrow, 72BSPH, of Avon, Illinois, was presented with UI Athletics’ Fight for Iowa award during the Penn State game in September after attending Hawkeye home games for 50 seasons without missing a single date. That same night, Marilyn Neely, 50BA, of Iowa City, attended what is believed to be her 70th straight home Big Ten opener—an occasion the university helped her celebrate with a tour of the Hansen Football Performance Center and a pregame visit to the sidelines. Few have witnessed more Hawkeye football history firsthand than Morrow and Neely, who each began attending games as UI freshmen and have been fixtures in the stands ever since. Morrow, 68, a retired pharmacist, began his streak in 1967 and faithfully makes the trip back on game days—not to mention plenty of other UI sporting events—from his home in western Illinois. PHOTO: COURTESY BOB MORROW Hawkeye fanatic Bob Morrow, 72BSPH, hasn’t missed a home game at Kinnick Stadium in 50-straight seasons and counting. Morrow’s streak nearly ended as soon as it began when he came down with pneumonia as an undergraduate and was hospitalized across the street from the stadium. When Saturday rolled around, he didn’t let his illness—or even a snowstorm that day—keep him away from his Hawkeyes. Morrow slipped out of the hospital, shivered his way through the game, then snuck back up to his infirmary bed. In the half century since, he’s managed to sidestep bad weather, weddings, and other football-deflating obligations. “I’ve always jokingly told my family that they better not die on a football weekend,” laughs Morrow, who also attends several road games a year and most bowl trips with wife, Sandy Morrow, 72MA. Neely, 89, has never kept an official attendance tally, but doesn’t recall missing a Big Ten home opener since arriving on campus as a freshman in 1947. In those days, she recalls, men wore suit coats and hats and women wore heels and handbags to the game. Times have changed, but Neely’s passion for the Hawkeyes has never waned. She still walks the mile from her home to most games and has traveled to numerous bowls and road games with her late husband, Marion Neely, 48BSC, 59JD; her daughter, Susan Neely, 78BA; and son, Bob Neely, 82BSE.